I’m on vacation this week and selected a book I’ve been meaning to read for quite some time as my “beach read.” I picked up Julie & Julia by Julie Powell on Friday night and finished it by Monday night, it was that good. One of the most authentic and open-hearted memoir-style books I’ve read in a while. I won’t spoil the book for you, especially if you’re planning to see the movie. 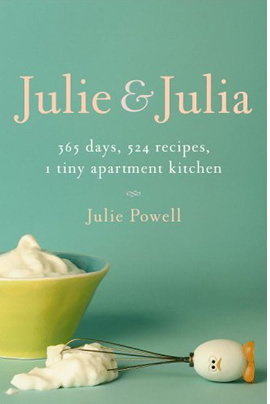 Obviously, it’s Julie Powell’s story of the year she spent cooking through Julia Child’s cookbook, Mastering the Art of French Cooking. She also shares insights into where she was at in her life and marriage at that time, and all of the things she learned about herself, her friends, and life in general by “cooking dangerously” (with her husband’s help) in a tiny outer boroughs kitchen in Long Island City. If you’re planning to see the movie and you want the whole story, please read the book, too. It’s incredible. Are you planning to watch Julie & Julia when it comes out in August? This film is on my list of most anticipated movies of the year. Amy Adams and Meryl Streep? Sweet! I’m so glad you’re enjoying it! I can’t wait to hear your thoughts. I learned today that the movie comes out August 7, and I’m thinking of trying to read Julia Child’s My Life in France before then. So glad you were able to get the book at the library! Oh, no, me, either! All of the aspic recipes sound gross, and I could never cook a live lobster. I don’t know how I’d even get one home!